>3M Double Coated Urethane Foam Tape #4032 - 1 in. x 72 yds. 3M Double Coated Urethane Foam Tape #4032 - 1 in. x 72 yds. 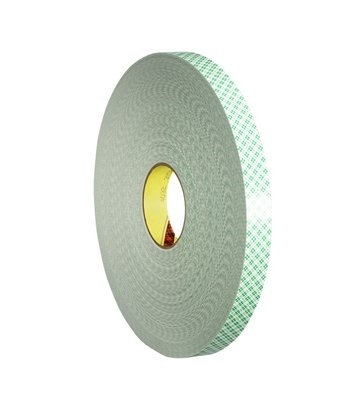 3M Double Coated Urethane Foam Tape 4032 is an off-white, 0.031 in. (0.8 mm) thick, double coated, open cell urethane foam tape that offers high shear strength. It is ideal for applications such as mounting interior signage and nameplates along with soap dispensers and air fresheners. 3M Double Coated Urethane Foam Tape 4032 is a 1/32 in. thick tape manufactured with 3M™ Adhesive 100 for a strong, permanent bond that works well with the open cell foam structure to produce high shear strength. This tape offers an ideal solution for a wide selection of bonding issues on various surfaces. This includes both interior and exterior applications where the tape will be protected from the environment. This tape features a conformable foam and adhesive combination which provides long-term holding at temperatures up to 220°F (104°C). By using a robust, green plaid, densified kraft paper liner, this tape provides you with reliable performance for industrial applications, such as die-cutting and automated dispensers. The liner also helps reduce edge roll and protects the tape from humidity extremes. 3M Double Coated Urethane Foam Tape #4032 - 1/2 in. x 72 yds.